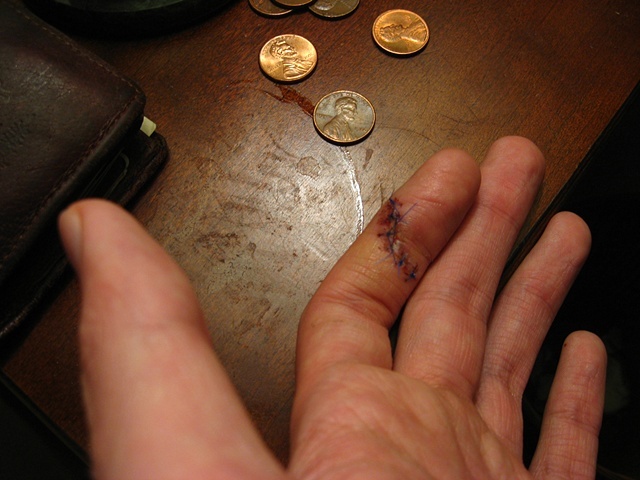 This a photo of when I had six stitches placed into my left hand index finger. I was at work cutting a ream of rosin paper when the fresh blade reached it's end inside my finger. I practically fainted while bleeding profusely and listening while my co-workers tell me I could tape and gauze it. I sought medical help instead. I lost feeling in my finger for about a month though eventually it recovered from nerve damage. More than anything, this signifies a rough patch of a few months or so when I was fresh from the heal of an epic cross country break-up and in the process of assisting my mother through her second bout with breast cancer. I don't expect any more sympathy and I've practically moved on, but 2009 was brash.